Dhammadharini bhikkhunis are going for Pindapat almsround in Sebastopol, on the second and fourth Friday of each month. The bhikkhunis will be arriving from Aranya Bodhi, Dhammadharini's forest hermitage on the Sonoma Coast and from Dhammadharini Monastery at the western foot of Sonoma Mountain.If there is interest, the bhikkhuni/s will be available to discuss the Dhamma after completing their silent meal. 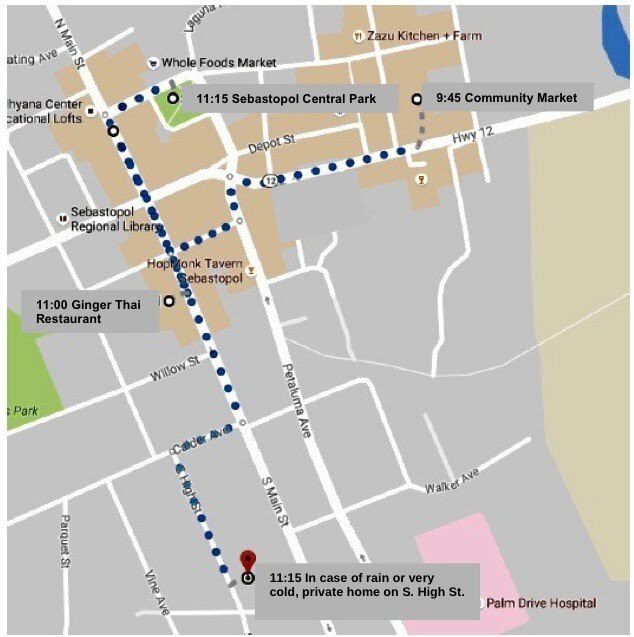 The bhikkhunis begin at the Community Market at 9:45-10:45 am, walk to the Ginger Thai Restaurant, and return to the Sebastopol Central Park in front of Whole Foods at 11:30 am. In case of rain or severe weather they will go to a private home instead of the Central Park (call for details).